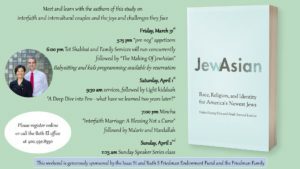 A weekend with Helen Kim and Noah Leavitt, the authors of JewAsian. Of all the deep and meaningful conversations that took place this weekend, there were two conversations that continue to challenge me. The first was from a conversation on Shabbat morning that revolved around the question of why Jews have left Judaism. The question being what is our responsibility to the unengaged or non-affiliated Jews of Omaha. What resources should we put forth, how should we go about reaching out to them, and assuming we are able to get in touch, what type of experiences will we create that speak to this demographic. It was mentioned very astutely during the session that as individuals who value synagogue life we look at those who are not engaged as if there are missing something. The comment was made they are hidden or in the closet, yet we must consider that these Jews may not feel hidden at all, in fact they may be proud to be Jewish but not engaged in the 1980’s sense of engagement, that being synagogue attendance. Now, I agree with this sentiment, I think those who give Judaism and by extension their synagogue community a chance, walk away with a greater sense of meaning and fulfillment in their lives…but that is my belief/opinion, it isn’t fact. Let’s use Apple Computers as an example. While not a waste of marketing dollars Apple spends less money annually to switch PC users over to Apple products as opposed to engaging customers who already own Apple products to purchase another. I own a macbook, iphone, watch…etc from Apple…those that like Samsung or Android products believe they have a great product, a commercial telling them their product is inferior is futile. Further, it’s hard to imagine that someone out there has not heard of Apple, they have made a choice to use another product. We can judge their choice, but it is their choice. The question is a similar one for the Jewish Community, which is how to diversify its experiences (its investments) to make the greatest impact. How does the Jewish Community creates a lineup of products that rival Apple? A commercial may not change minds…but hearing about a new product from a friend or colleague can make all the difference. Promoting programs in the Jewish Press, monthly newsletters, Facebook or twitter will perhaps, with no guarantee, touch those who are already involved, even peripherally (those that send their kids to the CDC, are members of the JCC, perhaps even members of the synagogue). With finite amounts of time and money where do you spend those vital resources. Do you try and engage our current membership base or do we attempt to grow our customer base? It’s not a zero sum game, but tough questions that we need to answer. The second question I walked away with this weekend is what does the Conservative Movement want its relationship to be with interfaith families. If you want interfaith families fully engaged then allowing membership, marriage and board participation seem like a natural means to their end goal. However, if that is not their end goal, it would be easier for the movement to simply say, “we are not open to interfaith families” and stop making small changes that do not make any qualitative changes towards the greater good as so many families see the prohibition against officiating at an interfaith marriage as the ultimate slap in the face. If we want to say YES to membership, and YES to being on the bima for a baby naming or b’nai mitzvah and YES to reading an English prayer during services and YES to interfaith burial then how do we say, “we cannot do your marriage, but we want you to join our synagogue”? There are no easy answers, but we owe it to our children and grandchildren to continue to search for answers. I would really love LOVE to see a nationwide grassroots call to formally outreach to non-members and ask what could be done to engage them more. Then to see concrete steps taken to close the participation gap. Along the way I feel like we will have to address concerns like lack of diversity, high costs, religious school schedules, lack of social justice or other programs which locals want to see at their local synagogues. By investigating this question we may ultimately resolve a myriad of underlying concerns. My question though is how do we get local organizations to undertake this research and response? Here in Atlanta I have called everywhere looking for someone who knows where my family might best fit in – our family includes Jews of Color – but none of the organizations has any idea which congregations have diverse memberships. When I call the synagogues directly, they can’t tell me any specifics. How has no one done this? So we are unaffiliated as are most of the JoC that we know locally. We are also interfaith, on a budget, and have a busy life that makes sending our children away for half a day on Sunday unappealing. It’s one of only two days that we are all together. Unfortunately no synagogues in our immediate area offer afterschool religious education options or have subscribed to Shalomlearning.org. If someone asked us, we’d share this feedback. If some organization in the local area was able to meet our needs, we would be members. I don’t think people are opposed to being part of the community synagogue. They just want one where the time, cost, community and membership itself provides a value – a return on investment- that it isn’t right now.